The refurbishment and conversion of the sixties built office block continues apace. The steel structure for the three additional floors is complete, with the fourteenth and fifteenth floor slabs formed. The posts which form the support system for the roof level building maintenance unit (window cleaning and inspection cradle) are clearly evident in the photo. 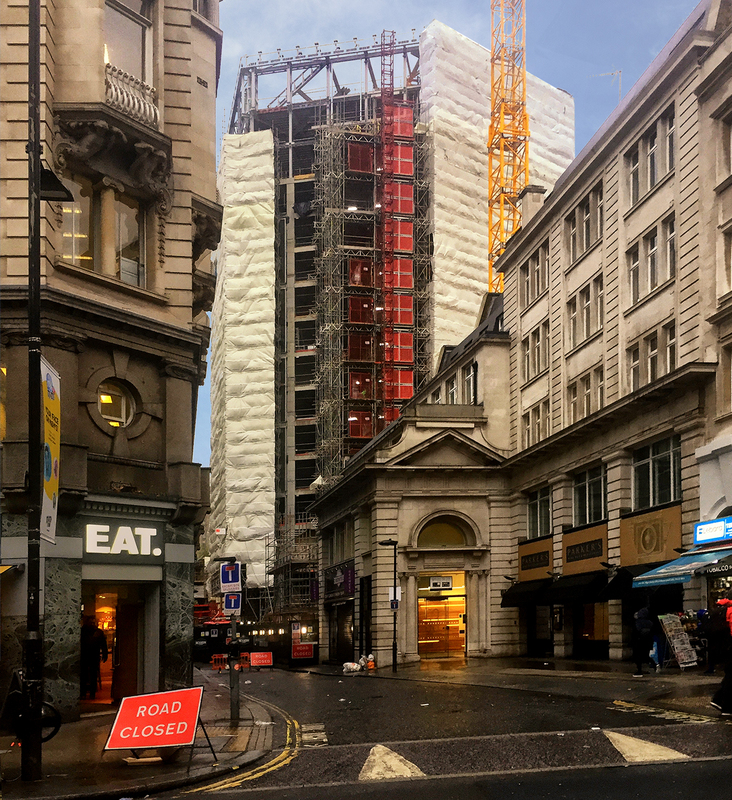 Demolition and structural works are underway at 18-22 Weighhouse Street, a property in The Grosvenor Estate’s Mayfair portfolio. 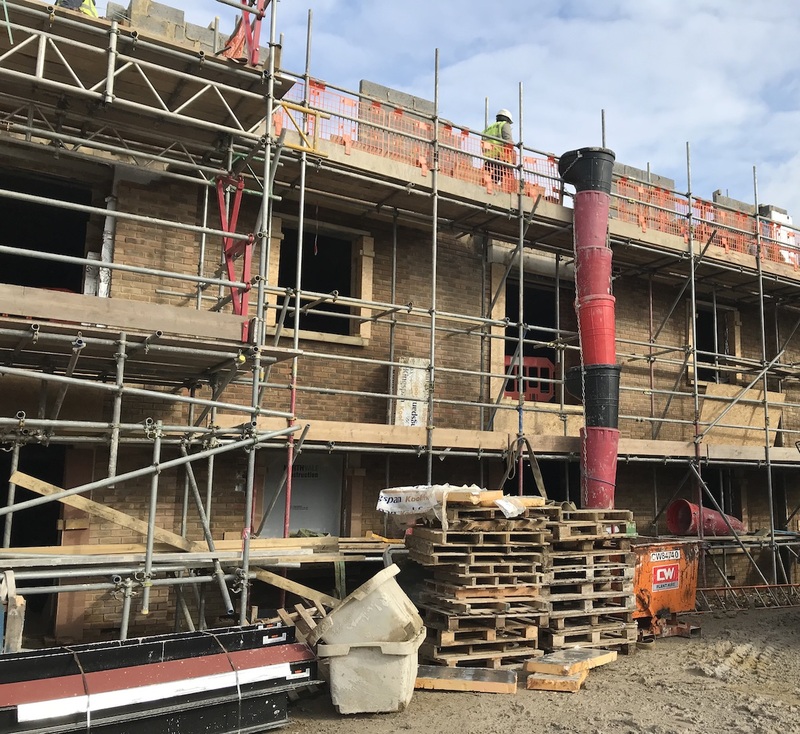 Temporary works are in place to facilitate the installation of the new structure, which is formed with steel box frames, and to permit the forming of three storey high openings through the existing party walls. The basement slab has been replaced and drained cavity tanking to the basement is in progress. 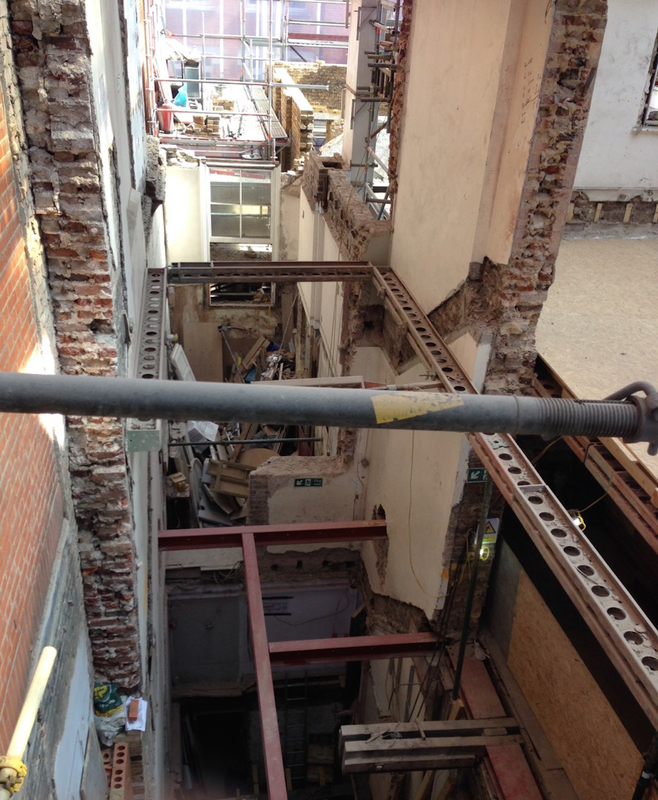 Temporary works to support the retained masonry structure and facade are in place and the internal floor structure has been demolished. New structural steel framing has been fabricated is being installed to form the new floor structure. 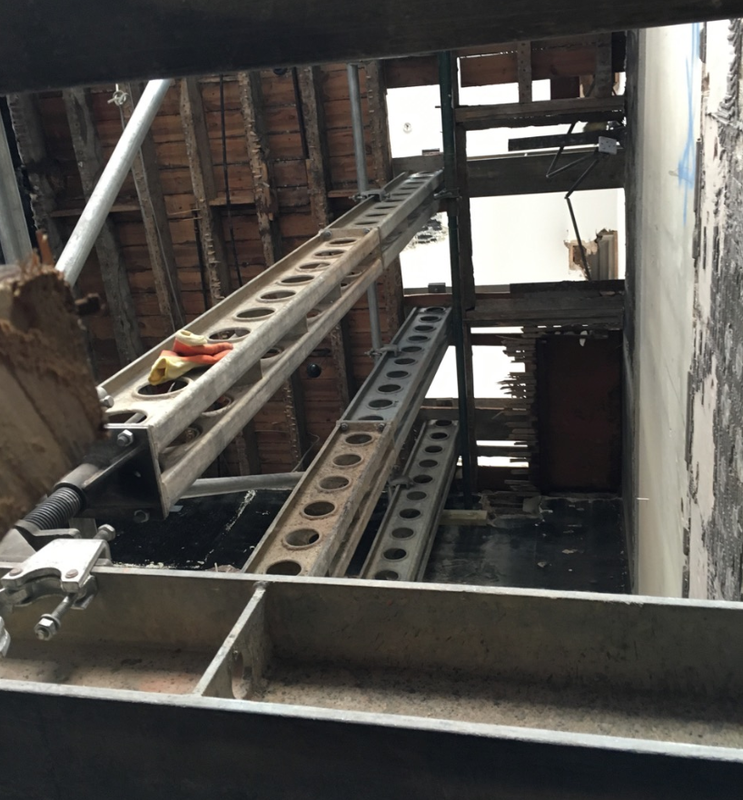 Construction off the new lift shaft is underway as is the cleaning and refurbishment of the retained facade. The structure for the new basement and lower ground floor level at Furnival House is nearing completion. Work has started to remove the load of the building from the temporary supports and transfer it to the new foundations, which is a substantial 750mm deep raft slab. A short section of basement retaining wall has been left not built to allow direct access to the basement from the ‘mole hole’ at the southern corner of the site. This provides access for the plant needed for dismantling the temporary works and the removal of the debris created by the removal of the concrete piles that have been supporting the building during the basement construction phase. 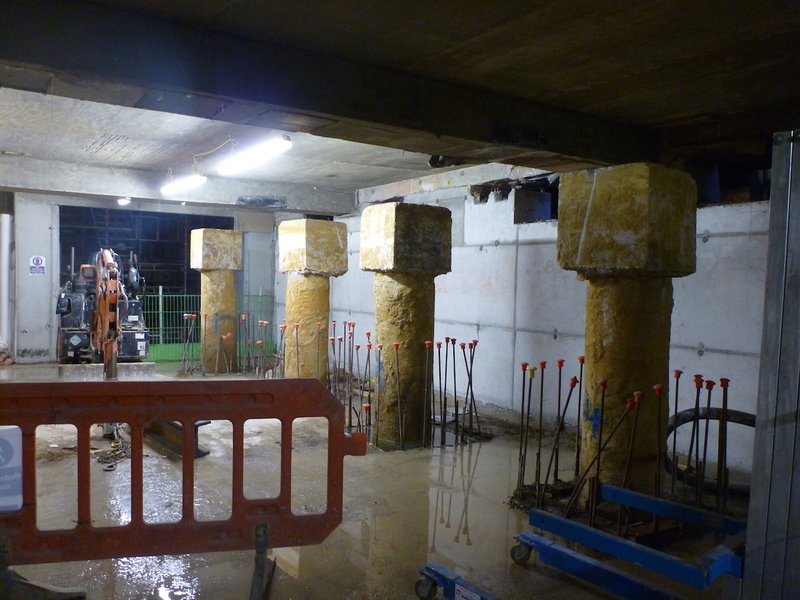 The photo shows some of the temporary concrete piles with nothing supported by them. Next phase is to break out the piles to below the level of the basement raft and infill the missing sections of slab. The new basement car park and lower ground floor leisure complex structure taking shape at Furnival House. 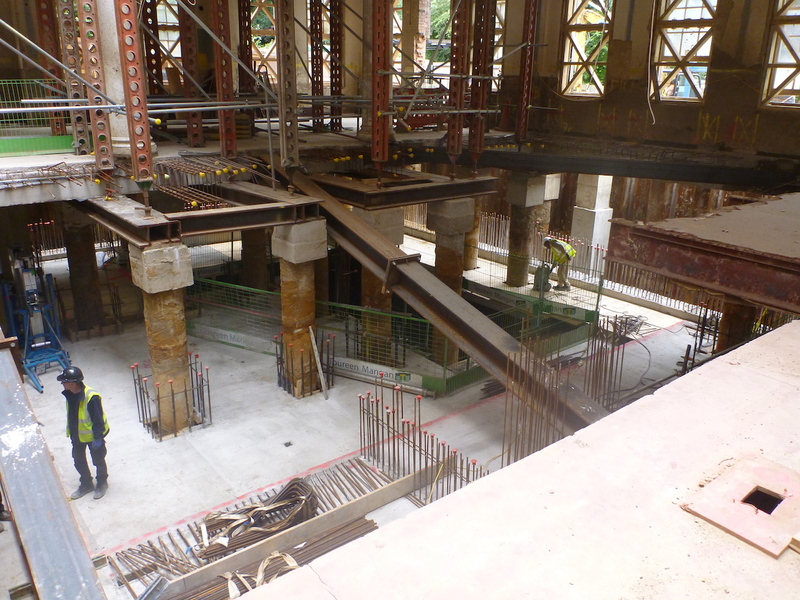 The photo shows the suspended lower ground floor slab below sections of the ground floor slab – all being built around the complex temporary support works comprising concrete piles, steel grillages and raking shores. Excavation in progress for two levels of basement under the existing Grade 2 listed Furnival House. 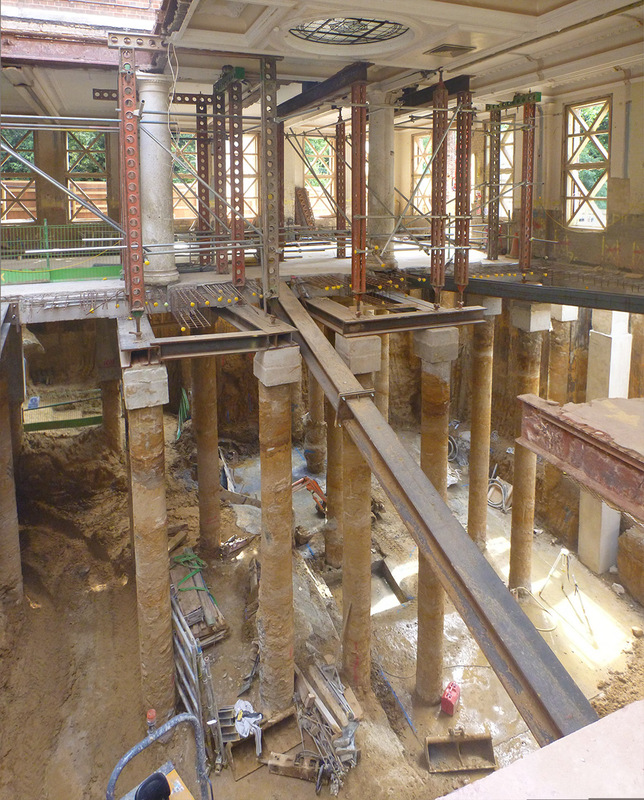 The photo shows the temporary perimeter sheet piled retaining wall, temporary piles/ columns supporting a new section of ground floor slab and the temporary props supporting the existing building above.